On the bank of the Danube, roughly halfway between Vienna and Budapest, lies Slovakia's capital Bratislava. Its charming Old Town (or Staré Mesto), nestled in a sea of communist-era flats, is compact and easily explored by visitors. Through the centuries, the city has been influenced by numerous neighbouring cultures, including Austrian, Czech, German, Hungarian and Jewish culture. It was a key centre of the Kingdom of Hungary and its capital under the Habsburg monarchy from 1536 to 1783. Even as the national capital, Bratislava is small (500,000 people). In fact, Slovaks call it a big village, and in many ways it is. For tourists, the main neighbourhoods of interest are the old city and surroundings, but there are some more remote areas, like Slavin and its upscale houses that are worth a look. For wine drinkers, take the tram out to Raca or Vinohrady and visit the vineyards, which produce nice white wines. Old Town (or Staré Mesto) is home to many of the city's historical buildings. New Bridge lookout (Nový Most) - At the very top of the bridge there is a saucer shaped lookout (both indoor with a restaurant and outside at the very top) with a great view back over the old town and over the river and rest of Bratislava. Getting to the lookout is a somewhat strange experience as the lift actually goes up at a slight angle. Kamzik - the looming television antenna, with a restaurant and great views of the Danube valley. 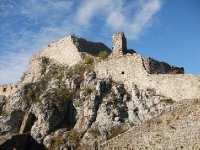 Devín Castle - can be reached by bus (lines 28 and 29), ferry, and for those who fancy an easy (4 kilometres) walk in the woods, but well marked paths. (Open from April until October, closed on Mondays.) Be aware that the top part of the castle has been closed since 2010, because there are not enough funds to renovate it. If there is one sport that the Slovaks love, it is Ice Hockey. At the Slovnaft Arena on Trnavska Cesta you can see games of the local team: HC Slovan Bratislava. The arena is also used for concerts by international artists. In the first weekend the Bratislava Marathon takes place, as this is quite early in the year circumstances are not always optimal for the runners or spectators. Another sport event that takes place is the Bratislava open tennis tournament, that takes place at the Narodne Tenisova Center in November. The same venue is also used for Fedcup and Davis cup games on the national team. The constant flow of suds may be the biggest attraction for many people at this 10-day long Bratislava beer festival, but drinking is not the only enjoyable attraction offered here. More than 300 musical performances are on this June festival’s bill each year alongside games, food, and raffle ticket draws for wonderful prizes. These elaborate three-day long ceremonies are a throwback to Bratislava’s more than three centuries as Greater Hungary’s capital, when 11 Hapsburg monarchs received their crowns within the city’s Dome of St Martin. Although the Hapsburgs no longer rule the land, their majestic era lives on during this September coronation re-enactment complete with horseback riding processions, shooting demonstrations, folk festivities, and actors taking the king’s oath on the very spot where the monarchs first ascended their thrones. Bratislava has a moderate continental climate with warm summers and relatively cold winters. Summers last from June to September with average maximum temperatures mostly between 22 °C and 26 °C in the lower parts of the country. Nights average around a pleasant 15 °C during this time. Winters, from December to March are usually a little above zero during the day and a few below zero at night, though cold spells of weather when the wind blows from the east are possible. The east and north of Slovakia is colder than the southwest, where Bratislava is located. Absolute highs and lows are 38 °C and -23 °C. Precipitation is quite evenly distributed throughout the year, with spring and summer somewhat wetter though. On average, there are about 10 days with some rain (or snow). Milan Rastislav Štefánik Airport (BTS), or simply Bratislava Airport, near the capital Bratislava offers a range of flights. Low-cost airline Ryanair offers by far the most flights with destinations currently being Alicante, Birmingham, Bristol, Brussels South Charleroi Airport, Dublin, Edinburgh, Girona, Las Palmas de Gran Canaria, Liverpool, London Luton Airport, London Stansted Airport, Malaga, Milan-Orio al Serio, Paris Beauvais-Tillé Airport, Rome Ciampino Airport, Stockholm-Skavsta and seasonal to Alghero, Palma de Mallorca and Trapani. A few other airlines serve destinations like Warsaw, Tel Aviv, Yerevan, Tirana, Prague, Kosice, Catania, Split and Zadar. Bus number 61 runs from the airport to the central train station and it takes approximately 30 minutes. Bus 96 (destination Prokofievova) also runs from the Airport. Be aware that tickets for the first 15 minutes costs €0.70, this will gets you until Bajkalska or Slofnaft Arena. If you want to go to the trainstation or the old town, you need to get a ticket for €0.90 that is valid for an hour. Some people find it easier to fly into Vienna and then taking the 1 hour bustrip from there to Bratislava. Slovak Lines has several busses daily. This costs €7.40 (additional €1 per big suitcase), or €60 for 10 single trips and leaves you off at the Central Bus Station (Autobusova Stanica). The Old Town is a short public bus trip from there. This busline runs from the airport in Bratislava, via the Bus station, and 2 more stops in Bratislava, Wolfsthal, Hainsburg, Vienna Airport, and the new Central Station at Südtirolerplatz in Vienna. Trains run frequently from Prague and Budapest, and hourly from Vienna. Bratislava has two primary stations - Hlavna Stanica (Central Station) and Petrazalka Stanica, which is located across the Danube from the old city. A number of buses run across the river, but you are better off trying to get into the Central station. From Vienna the train takes about one hour. The Railways of the Slovak Republic operates a network of railways in the country. Most trains depart from Bratislava and there are more expensive daily express train linking cities further east. With the borders open, driving in from Austria is easy, with a trip from Vienna taking about an hour. BBDS is one of the major bus companies in the country with frequent buses to and from Bratislava. Slovak Lines in cooperation with Eurolines has several busses daily, (also see the by plane section). Student Agency which operates from the Czech Republic operate on a lot of lines from/to the Czech Republic. Slovak Shipping & Ports operates ships on the Danube, including those to and from Bratislava. It is possible to get to Bratislava by boat from Vienna. The Twin city liner, connects the two capitals. The trip takes about 75 minutes. Some parts of the city are not accessible by car, including the old town. Most of the city, old and new, is reachable by a solid network of trams, buses, and trolley buses. You can get more information on the website of the municipal transport. You must buy tickets in advance, from tobacco shops or ticket machines located near stops. The former close in the early evening, and the latter only takes coins. So plan in advance if you are staying out late. After 11:00pm or so everything stops except night buses which are all signposted with N#. Always print a couple of tickets to carry with you, as not all stops have a vending machine. Please note that you should only take the €0.70 tickets if you are sure that you make the trip within 15 minutes (which is the period, after which these expire.) You need to stamp them, when getting onto the tram or bus. €0.90 ticket will last 60 minutes during the week and 90 minutes during the weekend. Bratislava is a compact city, and getting around by foot is the preferred method to explore. This is particularly true in the old town, where car transport is nearly impossible due to the many tables and chairs placed on the 'street'. There are no dedicated bike paths in the old town, but there are two excellent paths along either side of the Danube river. In fact, one can bike to Vienna, Budapest or a little bit closer, Devin Castle along a lovely path away from cars. The countryside surrounding Bratislava is superb for cycling, with good, almost flat, bicycle paths along the Danube and Morava rivers. If slopes tickle your fancy, then the Carpathian range is nearby with plenty of trails for mountain bikers and more fit riders. Beware of thieves in the city and try and keep your bicycle in sight, or locked with a good lock. Slovakia is typical of Central Europe in that most foods are of a hearty nature, usually meat and a starch (potatoes, rice, etc. ), washed down with beer. Typical meals include Goulash or the Slovak national dish Bryndza Halusky, a potato risoto covered in a tangy, salty white cheese and bacon. It is somewhat of an acquired taste, but good on cold days. Vegetarians suffer somewhat in Slovakia, even in Bratislava, as the Slovak concept of "meatless" permits a liberal usage of bacon. However, a growing number of places in the old city and in ethnic restaurants now offer more varieties for those who go meatless. When in doubt (and one should always be in doubt about whether dishes come with meat in Slovakia), ask "Bez Mesa?" (without meat?). The most common non-Slovakian food is Italian - the Slovaks are crazy for Italian food. It is usually of the southern red-sauce variety, but can be tasty. Chinese, Sushi, Indian and Middle Eastern can also be found in and around the Old City. Slovak Pub and Flagship offer a large choice of local and international dishes, and also provide cheap student meals. Bratislavski is a busy pub and restaurant but also offers a variety of local and international dishes. Primi concentrates more on international cuisine, with a large variety of pizza's and pasta's. Beer is one of the main drinks in the city. One of the raisons d'etre of Slovak life, it is easy to find, cheap and tasty. If you like a malty dark beer, you are mostly out of luck, as the Slovak dark beer (Tmave Pivo) is very sweet. The Pilsner, which at times is closer to a weak ale, is quite nice, and varies in strength from brewery to brewery. The Slovaks also like fruit based alcohol, but don't be fooled. This stuff, depending where it comes from will peel paint and fix anything wrong with you. Try them all, and should you find them too strong for you, try it again - it gets easier! If you want to mix with the locals, you will have to order Kofola instead of a cola. The taste is not quite the same, and not everybody likes it (references to it tasting like cough sirup have been made), but you will get some respect for at least giving it a try. On the bright side, if you are on a tied budget it is the drink for you. Most visitors to Bratislava choose one of the many restaurants or cafe's in the old town for drinks. Also the party and restaurant boats moored on the river are popular at night. There's also a really interesting nightclub inside a bunker from the war that has a slightly claustrophobic feel to it, but good dance music. Citizens of the EU can work freely within Slovakia. However you will need to report to the Foreign Police at Hrobáková 42 (used to be at number 44.) to be registered. If you want you can also apply for a Slovak ID card, but that is not mandatory for people with a EU passport. You will need to bring a copy of your contract with you, recent pictures (passport size), and fill in 2 forms. (ask you employer if they have copies for you, so you can do that already at home.) You will also be able to receive a Slovak birth number. Please be advised that none of the staff speaks (or is willing to speak) any other language than Slovak. Apart from that you will need to open a Slovak Bank Account. (e.g. at VUB Bank, Tatra Bank, CSOB or any of the others). You should also do a short medical exam before signing the contract with your employer, but this can in most cases also be done after signing the contract. When you are leaving the country, you should again visit the foreign police and have your entry removed, and as well cancel your insurance. If you have stayed longer, and you expect a tax refund, you will need to keep your bank account open. Wifi and broadband can be found more or less everywhere, and there will be an internet cafe available somewhere even in smaller towns. Also, shopping centres, hostels, pubs, cafes, and some public institutions such as libraries or government buildings offer (free) wifi. The international calling code for Slovakia is +421. In case of an emergency, call the universal number 112. You can also call directly on 150 for fire brigade, 155 in a medical emergency or 158 for the police. Slovak phones operate on the GSM standard, which covers most of the country, and 3G covers most of the area. The coverage is surprisingly good, and you will often have signal even in mountain areas, unless you are in a deep ravine. There are three main operators - Orange, T-mobile and O2, and they all use 900 or 1800Mhz standard, which might not be compatible with some U.S. phones operating on 1900Mhz. They all (along with some virtual operators, biggest of which are Funfón and Tesco Mobile) offer a variety of prepaid cards with various "pay as you go" schemes (some market research is advised, if you want the best deal) and incentives. If you have an unlocked phone, these are easy to pick up in any phone shop, or you can purchase a cheap phone with a prepaid card included. There are still some phone boxes available, but with mobile phones now commonplace, they are declining in number. Also note that you might need to purchase a prepaid card to use some of them. Slovenská pošta is the national postal service of Slovakia. They have affordable, reliable and relatively fast services. You can choose to send letters/postcards first (express) or second class. Prices start at €0.40 for a second class letter (up to 50 gram) domestically, €0.60 for express services. Within Europe prices start at €0.90 (Czech Republic €0.80), outside Europe prices start at €1.00, all for second class letters/postcards up to 50 grams. Post offices are available in all villages and provide banking services like money transfers as well. The post offices are usually open from Monday to Friday 8:00am to 6:00pm and on Saturday until 1:00pm. The main post offices in larger towns or shopping malls are open daily to 8:00pm. It is possible to buy post stamps for post cards and letters directly in the post offices or in some newspaper stands. You can use parcels services with Slovenská Posta as well, although you might be better off with companies like UPS, TNT, FedEx or DHL, which offer similar prices, but usually faster and more reliable services. We have a comprehensive list of accommodation in Bratislava searchable right here on Travellerspoint. You can use our map to quickly compare budget, mid-range or top of the range accommodation in Bratislava and areas nearby. This is version 81. Last edited at 3:08 on Aug 2, 17 by sleepBot. 52 articles link to this page.